*Transparent cable which makes the lighting effect more scenarized. *Each clip equipped with warm white LED, which emanates a soft glow, casting a beautiful light in the surrounding area, whilst perfectly highlighting whatever you have chosen to be held by the clip. *With widely usage, you can install on most surfaces: wall, window, door, floor, ceiling, grasse, Christmas tree, etc. Perfect decoration for home, living room, car, wedding, Christmas, Valentine¡s Day and so on. <1>NOT WATERPROOF, to maintain the long life and good function, please keep it from rain and dampness. <2>DON'T stare at the LED light bulbs directly as they may damage your eyes. This Product contains small parts, please keep away from babies and little children. 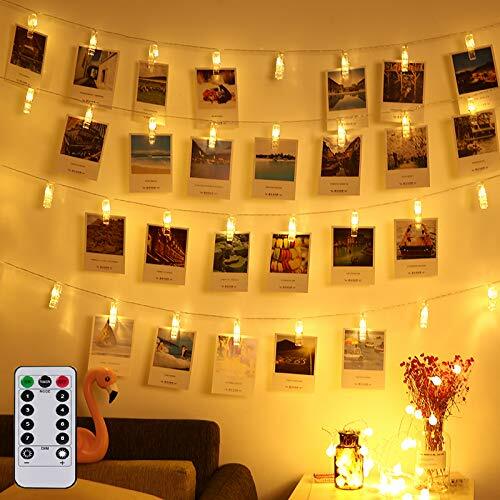 *Create Romantic Atmosphere-- Each LED bulbs equipped with a transparent clip which can nip photo or other small Items creating excellent illumination and a warm atmosphere, spreading light and cheer across a wide area. It is indispensable for festival decoration. *20 Clips & Battery powered- 20 clips are spaced at 8 inches apart. Have enough space for most artworks and photos. Powered by 3AA batteries(Not Included). Easy to take outside without having to worry about your display being near an outlet or power source. *Update Version with 8 Mode Remote-8 lighting modes which are: Combination;In wave;Sequential; Slo glo;Chasing/Flash; Slow fade; Twinkle/Flash; Steady On; With a remote in hand, you can easily turn on/off the lights. All is in your control! *A perfect Lighting Decoration- Decorative your garden, porch, living room,bedroom, even the party with the string light to add a beautiful glow to your life. Beyond in house decoration, it can be used in special occasion like Valentine's Day, banquet, propose, wedding displaying your photo, etc. If you have any questions about this product by Magnolian, contact us by completing and submitting the form below. If you are looking for a specif part number, please include it with your message.